A day or two before Texas’ baseball season began, senior Matteo Bocchi was asked to change the way he pitched the baseball. “It surprised me a little bit,” Bocchi said almost two months later. With Bocchi not pitching as well as they expected, Texas head coach David Pierce and pitching coach Phil Haig suggested a slight drop in his arm slot. A similar move, after all, had worked with former UT reliever Parker Joe Robinson. Bocchi, who had once thrown from a side-armed slot while in junior college, wanted to help the Longhorns so he gave it a try. Over his first nine appearances and 16 2/3 innings of work, Bocchi mostly pitched well and compiled a 2.70 ERA. On Tuesday, though, he posted the best results of his senior season. Bocchi threw three innings of hitless relief as No. 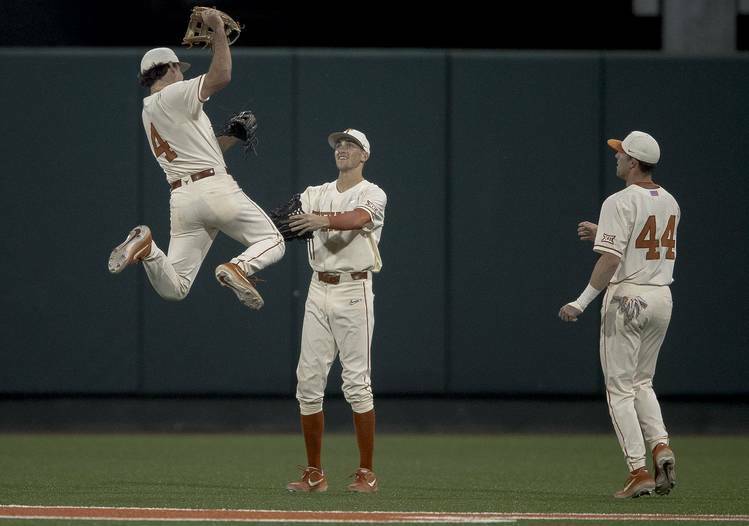 14 Texas opened its week with a 3-1 win over Rice at UFCU Disch-Falk Field. Bocchi was the pitcher of record on Tuesday. It was his first victory since beating Tennessee Tech in the third game of last year’s NCAA super regionals. With Texas (22-13) nursing a 2-1 lead, Bocchi was given the baseball in the fifth inning. He retired the Owls in order that inning. Texas committed an error the following inning and Bocchi hit a batter in the seventh session. Three of Bocchi’s 38 pitches were used to complete strikeouts. Even through Bocchi got the win, Pierce called sophomore reliever Tristan Stevens the “pitcher of the night.” With one out in the fourth inning, Stevens inherited runners on second and third base. Three days after he registered a key strikeout in an 8-6 win at Baylor, Stevens got Texas out of the jam with two more strikeouts. On Tuesday, Texas also got two outs from left-handed reliever Brandon Ivey and a four-out save from Donny Diaz. That effort out of the bullpen made the one-run lead that UT grabbed in the third inning stick. Duke Ellis led off UT’s first-at bat with a triple and later scored on an Austin Todd single. After Texas countered Rice’s only run with Lance Ford’s RBI single in the third frame, Ellis scored again in the sixth inning. Tuesday’s victory was the 300th of Pierce’s career. In addition to the three seasons he has spent at Texas, Pierce led the baseball programs at Sam Houston State and Tulane from 2012-16. He also worked for 10 seasons as an assistant coach at Rice. Around the bases: Texas freshman Ty Madden allowed four hits and an earned run over a start that lasted 3 1/2 innings and 62 pitches. … Pierce said freshman Eric Kennedy could have played on Tuesday but the starting outfielder was given a physical and mental break … Rice (14-21) turned a season-high four double plays. … With a 4-4 record in Big 12 play, Texas will host Kansas State (13-20; 1-5) this weekend.